While it is still cold in Denmark, the days are noticeably longer. I feel like we are emerging from a cold, dark cave into dazzling sunshine. What a difference daylight can make. After two months of running in the pitch black and being scared of cars in the dark, I can actually see and be seen when I go out in the morning. It’s light when I go to help in the kitchen and light after dinner. I’m breathing a sigh of relief that I made it through the dark, Scandinavian winter and have come out on the other side. I apologize for the long break from blogging. I place some of the blame on the dark, depressing winter, and the rest on the fact that I’ve been using my free weekends to make cheese!! As many of you know, I took a week-long cheese-making class at the University of Wisconsin, River Falls, shortly before coming here (Wisconsin is serious about its cheese). It took a while to locate Svanholm’s cheese molds, order bacteria and rennet, and figure out a cheese press, but I have now made several batches of both feta and farmhouse cheddar cheese. I’m feeling comfortable enough now with my cheese-making that this week I did it on Wednesday while also doing other chores in the big kitchen. No longer do I feel the need to focus exclusively on the cheese-making process during the 5-6 hours it takes, so I’ve got my weekends back and time to blog! I thought I’d spend the bulk of this blog entry to respond to requests I have gotten to walk through the basics of cheese-making. One thing I really have going for me here at Svanholm is the quality of the milk. 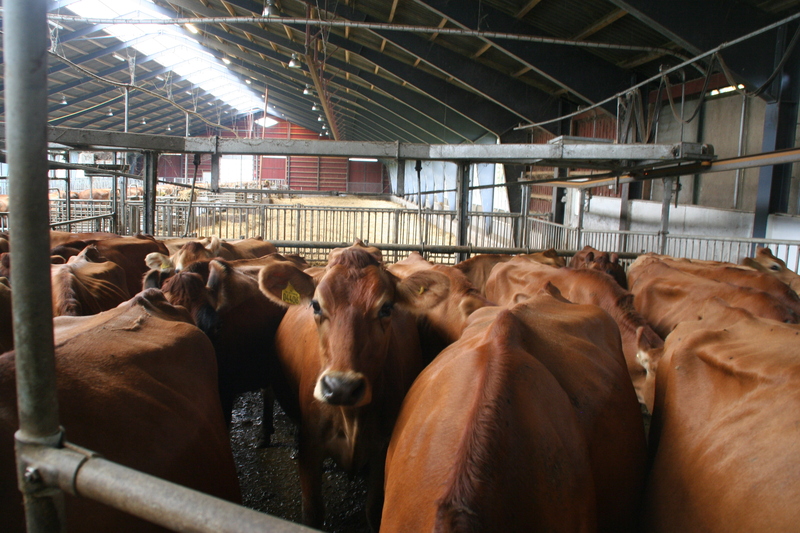 It all starts with our happy cows, which you can see below waiting to be milked. 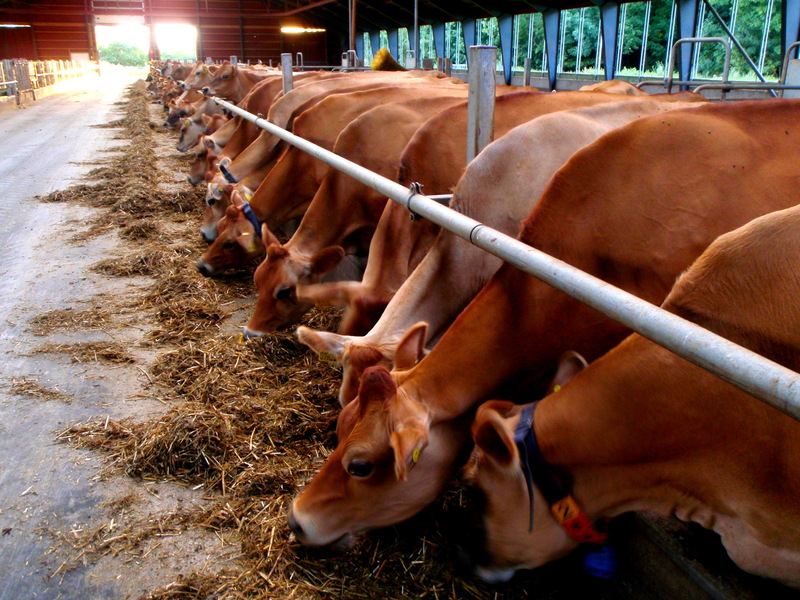 The cows are so cooperative that one person can milk all 120 of them. 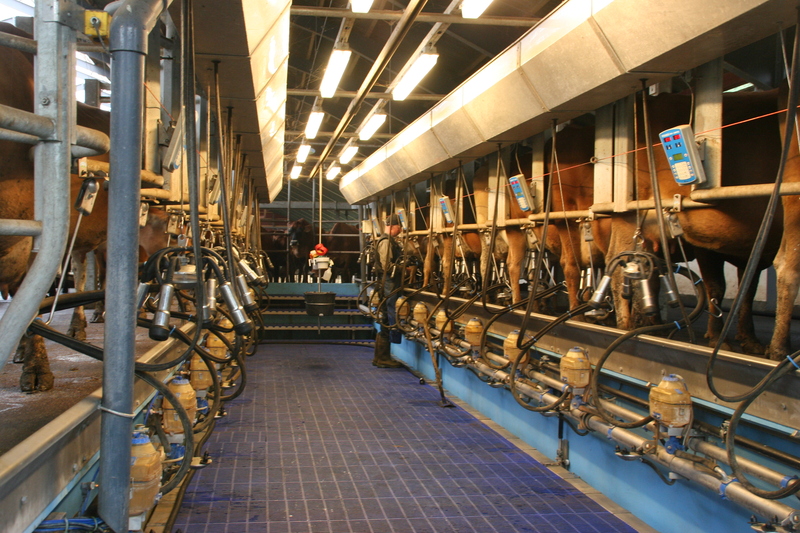 They wait patiently for their turn and when the gate opens they file in and line up by the milking machines. I’m told that the cows cooperate so well because they appreciate getting milked AND because they know that food awaits them when they are done. They enjoy their hay and really love the few potatoes that are mixed in. The milk from our Jersey cows is so good that a premiere Danish ice cream maker buys all the milk that we don’t use in our own kitchen. The milk that we use is not pasteurized; this is also known as “raw” milk. 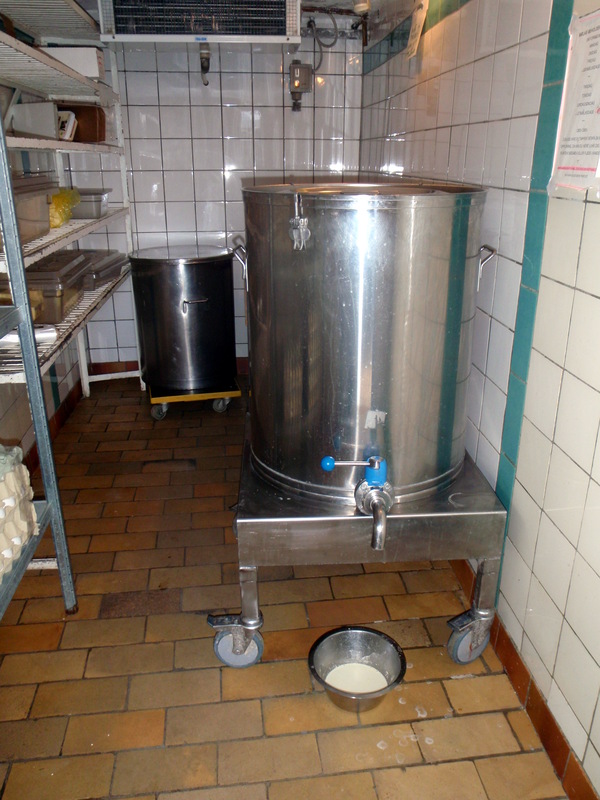 We store it in a large tank in our dairy refrigerator from which people help themselves. The large tank to the rear of the frig contains our delicious homemade yogurt. So I start with 15 liters of wonderful, raw milk from healthy, organically-raised Jersey cows (that’s about 4 gallons). It took some trial and error, but I’ve found two pots that fit together well in a double-boiler setup, so that I can heat the milk indirectly. I heat the milk to 32°C (90°F) and add a half a teaspoon of a mesophilic starter culture, cover and let it “stew” for about 45 minutes. Next comes a teaspoon of animal rennet, diluted in some non-chlorinated water, stirred in, covered and allowed to sit for another 45 minutes. At this point, the excitement begins! The liquid milk has been turned into a solid and it’s time to cut the curd. 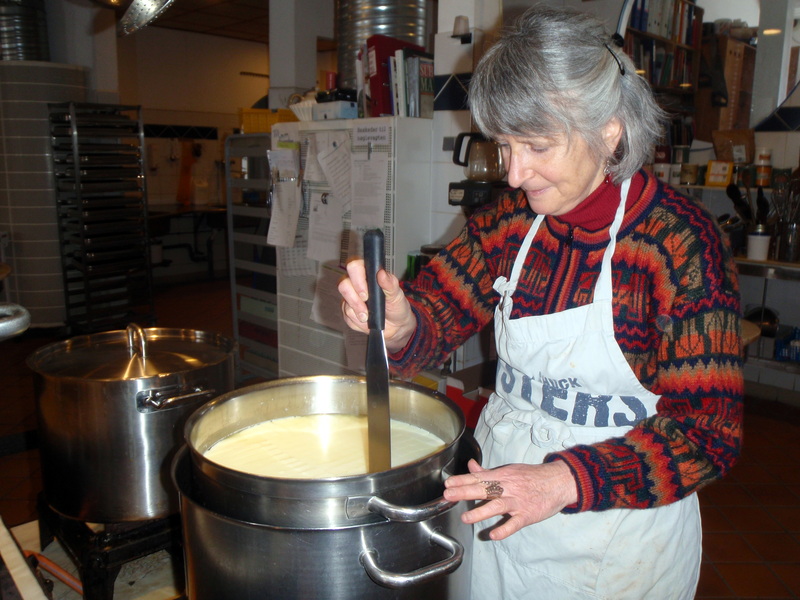 Cutting the curd is a little tricky, in that after you’ve made vertical cuts down and across, turned the pot ninety degrees and again cut down and across, you need to hold your cutting tool at an angle to cut the long blocks you have created. The idea is to end up with 1/2′ (1cm) sized cubes. 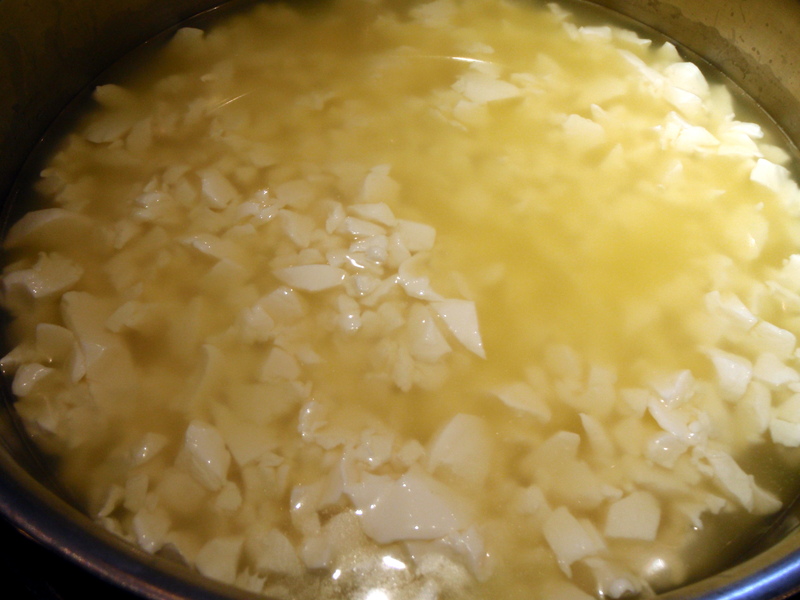 The whey starts being released from the curds right away as you cut, as you can see below. 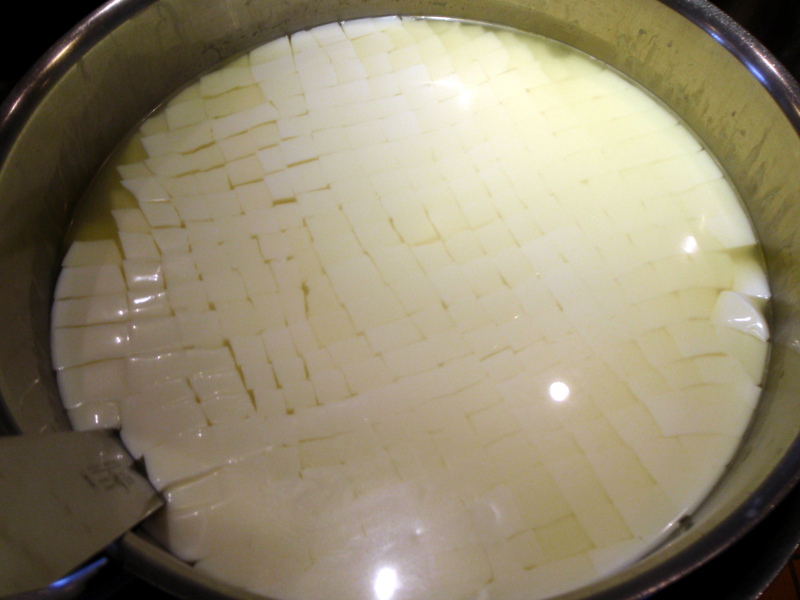 Because I’m making cheddar cheese, the next step is to cook the curds by gradually heating them up to 38°C (100°F), stirring occasionally to keep the curds from clumping together. More whey gets released in this process, which takes about 1/2 hour. After letting the cooked curds rest for about 5 minutes, I transfer them to a cheesecloth-lined colander, tie them up and hang them for an hour. This lets more whey drip out of the curds and while they are hanging, I make a simple ricotta cheese out of the waste whey. That just requires heating the whey to 90°C (195°F) and adding some lemon juice or vinegar. 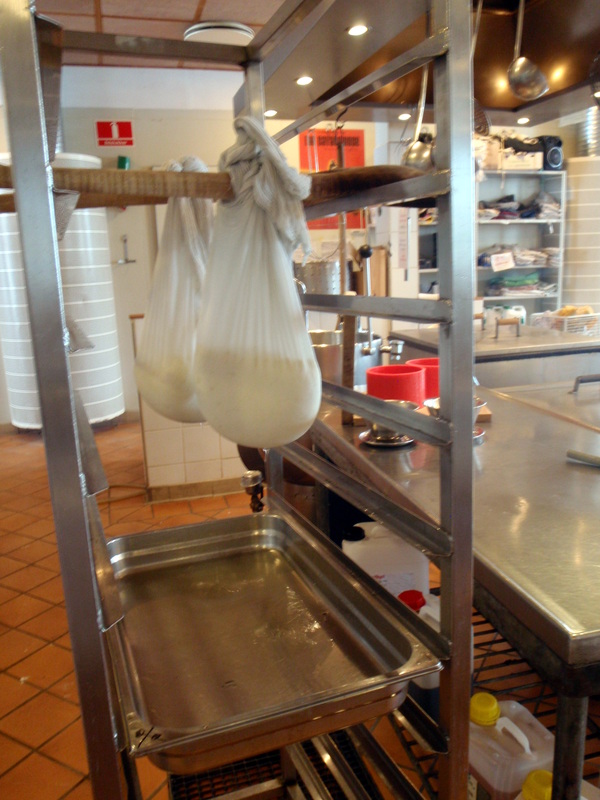 The ricotta precipitates out of the whey and gets drained and hung up like the cheddar. After hanging for an hour, the cheddar gets taken down and “milled”. This means I spend about a half an hour tearing the cheese into walnut-sized pieces. Why do that, you might ask? It’s at this point that salt gets added, which stops the bacteria culture from continuing to work and milling gives more surface area for the salt. 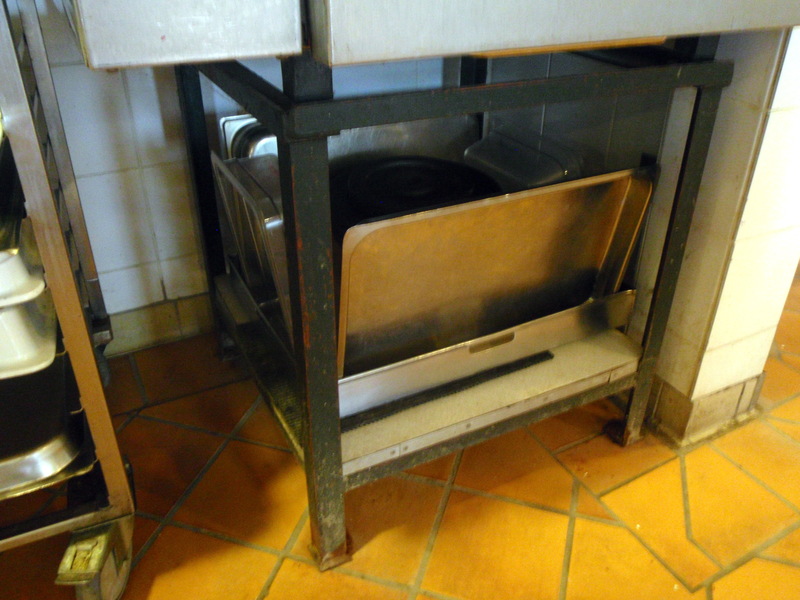 Below you can see the cheese just prior to milling. 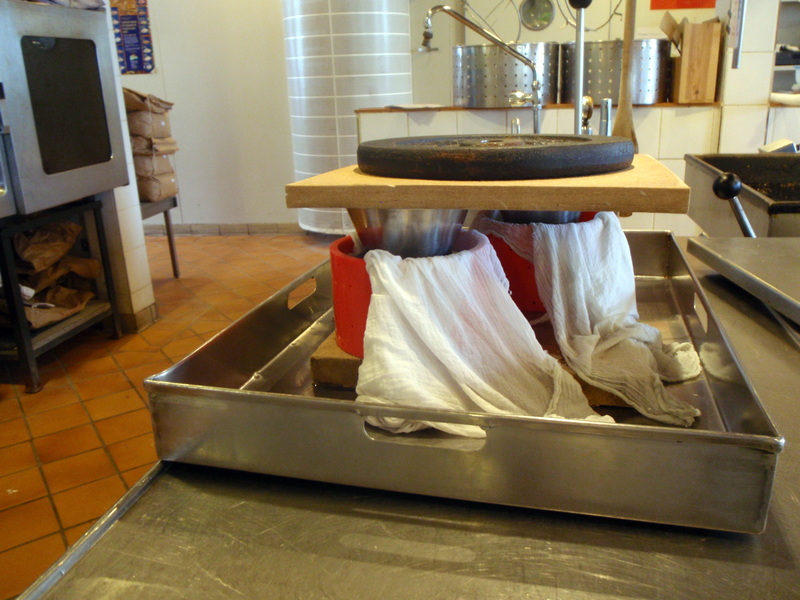 After milling and salting (and adding herbs, if desired), the curds get placed in a cheesecloth-lined cheese mold. A “follower” is placed on top (in this case I’ve improvised and used a gravy bowl), then a board, and then weight. I start the cheddar off with 5 kg (11 lbs) for 10 minutes, followed by 10 kg (22 lbs) for another 10 minutes, followed by 25 kg (55 lbs) overnight. I borrow weights out of the fitness room, which is conveniently located above the kitchen, and hope that no one misses them too much for the one day that I use them. Then I tuck everything away to get it out of the way for the group that washes up after dinner (we sign up and take turns for this duty, by the way). You may note that I’ve got some extra pans included as part of the setup — from experience I’ve improvised to keep the whole contraption from toppling over. I’ve put in a birthday request with my son for him to build me a cheese press for my return to Minnesota that will make this precaution unnecessary. Not having to lug 50 pounds of weights around would also be nice. 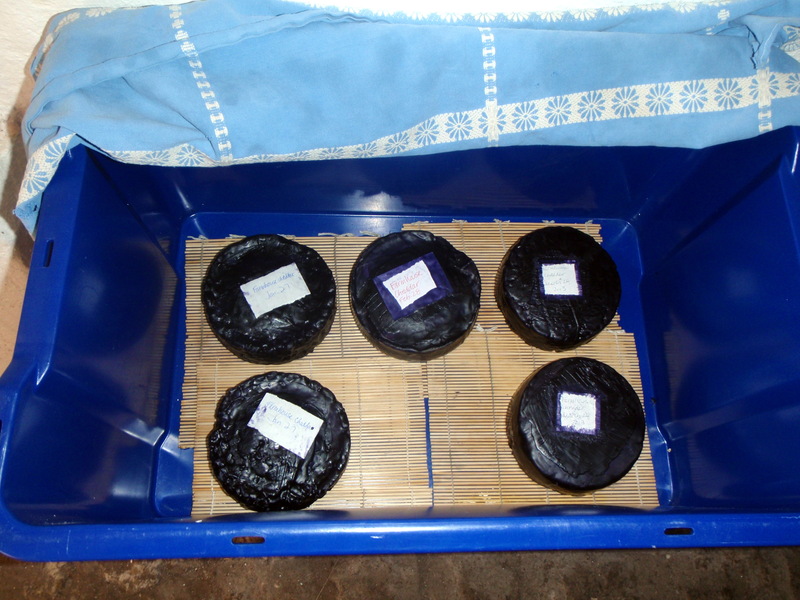 The next day, the cheese is taken out of the molds and then allowed to air dry at room temperature for a couple of days. 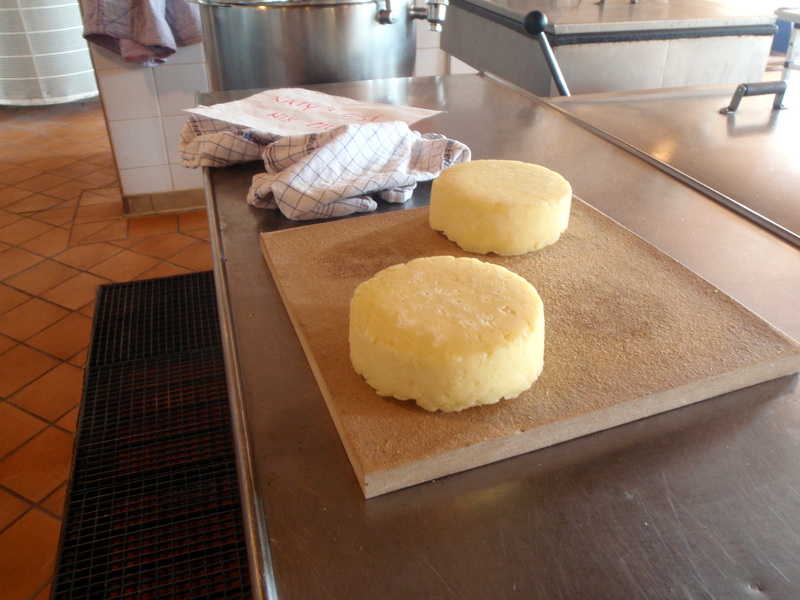 After air-drying, the cheese is ready for waxing and storage. 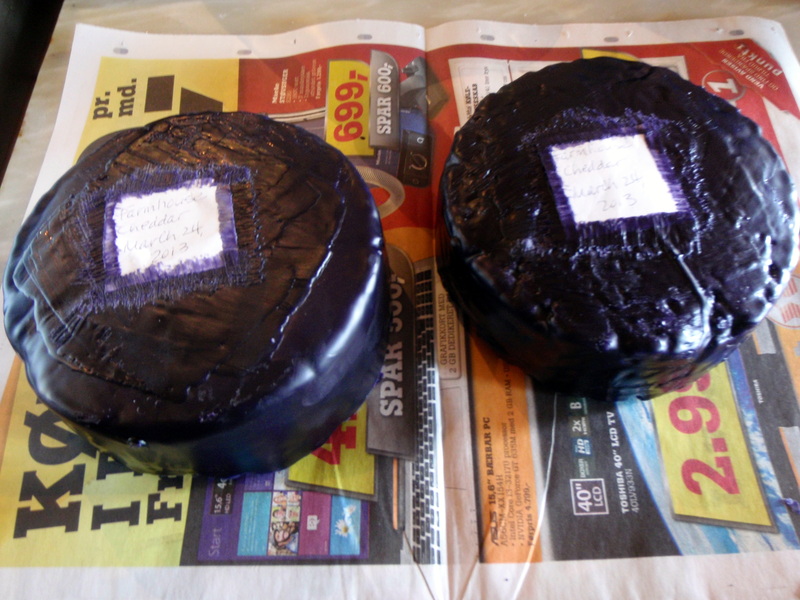 Here’s what the cheese looks like both before and after waxing. Notice the label, which indicates the type and date of the cheese. 15 liters of milk makes about 1.5 kg (3.3 lbs) of cheese. And if it looks like one round is missing from the photo below, it’s because my daughter received one as a birthday gift last weekend. My farmhouse cheddar is supposed to age at least one month, preferably longer, but we eat it pretty much as soon as we can here. The cheese is supposed to age at about 58°F (14°C) and about 80% humidity. 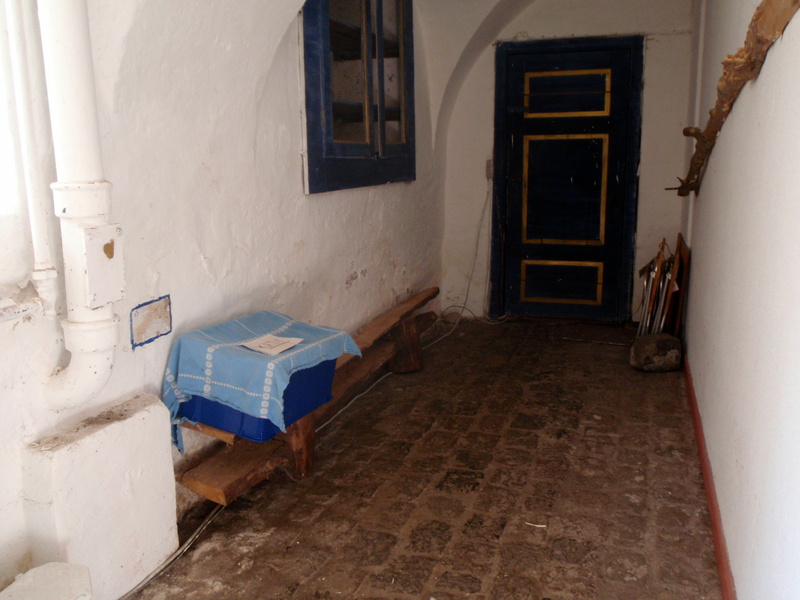 I’ve found a spot in the oldest part of the manor house (dating from the 1300’s) that seems pretty good. When I get home, I’m thinking I’ll buy a mini-fridge. So that’s a quick course on cheese-making. 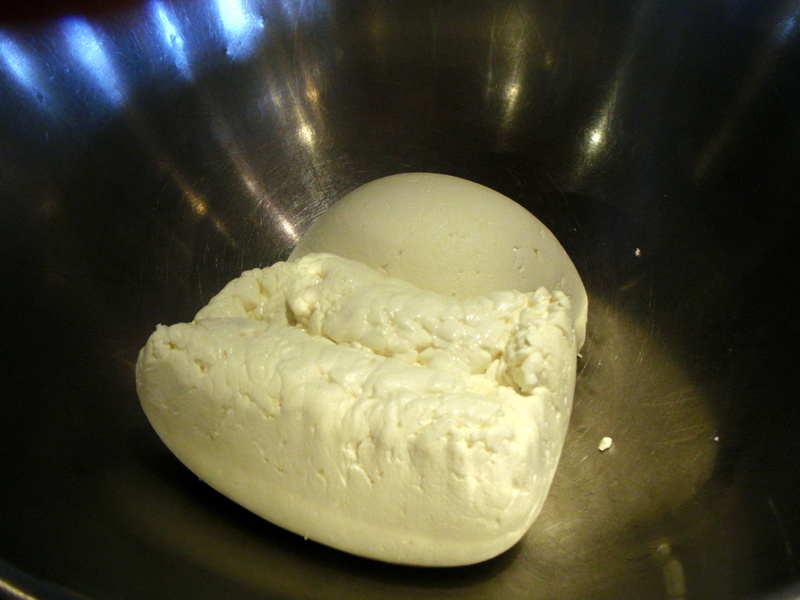 I’ve also made feta cheese while I’ve been here, which doesn’t require the cooking stage and doesn’t need to age. Feta is supposed to be made with goats’ milk, of course, but if I add lipase powder to the cow’s milk, it is a pretty good substitute. I plan to travel with my daughter to SE Asia in June and July, meet a girlfriend in Tallinn, Estonia and travel with her to St. Petersburg, Russia for the first two weeks of August, and then meet my Swedish friends in Karpathos, Greece for a week (and my son may come join us!). After all that travel, I’ll come back to Svanholm for a few days to pick up my stuff and fly back to Minnesota in time to catch a day at the State Fair. It has been a wonderful year. I have learned so much here, living among people who are very different from one another, but who have formed a cohesive community that discusses and works through its issues. A community that demonstrates its values of organic farming, income sharing, communal living, and self government. A community that manages its natural and human resources intelligently and also knows how to have fun. My current plan is to enjoy Minnesota from September through the end of the year and then to return here next January for an additional three months or so. My daughter should be done with her Master’s program about then and has suggested that my chances are better to get her back to the States if I’m here when she finishes. I’m honestly skeptical because she really likes living in Denmark, but it will make it easier to say good-bye if I know I’m coming back. Blessed are the cheese makers, Katie! Sounds wonderful.! I just returned from 9 weeks in SE Asia and would be happy to share information. It was my way of avoiding the darkness of winter. I’m so glad to hear Minnesota is in your plans. I’ve been worried you were not coming home to us!